"JANGAN ADA NUKLIR DI ANTARA KITA", mengikut kepada lagu "Jangan Ada Dusta di antara Kita" yang dinyanyikan oleh Broery Marantika dan Dewi Yull. Hal ini kusampaikan kembali bahwa bahaya PLT Nuklir lebih besar dari pada bahaya PLT Diesel, Air, Matahari, Angin dan energi terbarukan lainnya. 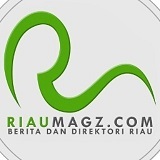 Berharap tidak ada satupun bank atau lembaga keuangan manapun yang mau memberikan pinjaman atau pengelolaan dana pembangunan nuklir di Indonesia. Hal ini terjadi di Jaitapur India yang sedang membangun PLT Nuklir yang didanai atau pengelolaan dananya melalui BNP PARIBAS dan HSBC. BNP Paribas adalah bank eropa yang bermarkas di Boulevard des Italiens, Paris, Perancis, merupakan bank hasil merger antara Banque Nationale de Paris (BNP) and Paribas. Sedangkan HSBC (Hongkong and Shanghai Banking Corporation) adalah semula bermarkas di Hongkong yang dipindahkan ke London di tahun 1990-an. Didirikan oleh Sir Thomas Sutherland di Hongkon tahun 1865. Greenpeace mengajak simpatisan untuk meminta kedua bank tersebut menarik diri dari pengelolaan dana PLTN Jaitapur untuk menghindari terjadinya keadaan bahaya di kemudian hari, untuk menyelamatkan anak cucu kita. Masih banyak cara untuk mendapatkan penyediaan energi bagi masyarakat. JANGAN TERULANG KEMBALI KEJADIAN FUKUSHIMA MAUPUN CHERNOBYL. Exactly two months ago an earthquake and tsunami hit Japan. Together, they not only resulted in a huge natural disaster, but also triggered an unprecedented man made tragedy. The Fukushima nuclear power plant is still out of control, threatening thousands of people's health and livelihoods. If making mistakes with nuclear energy is bad enough - not learning from those mistakes is indefensible. 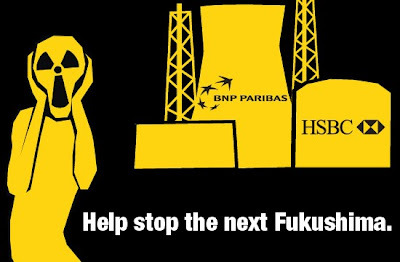 Help us encourage banks like BNP Paribas and HSBC to learn the lessons of Fukushima and invest in safe, sustainable energy by writing to the boards of these international banks and asking them to help us stop a very risky and unnecessary nuclear project in India. The proposed plant in Jaitapur, India looks set to repeat the same careless and shortsighted mistakes that turned a catastrophic natural disaster in Japan into a Chernobyl-scale nuclear disaster for the entire planet. The Indian Environment Minister has admitted that the government's current nuclear plans for a massive coastal nuclear power plant do not cover the possible event of a tsunami. What's more, the proposed site is located in an area of high seismic activity and fragile local ecology. The stage seems set for yet another potentially disastrous nuclear catastrophe. Such ill-conceived plans are very expensive, and require financial backing from major banks like BNP Paribas and HSBC. At a time when investment in clean, renewable energy is desperately needed to save our planet, these banks choose to maintain the destructive status-quo by continuing to invest heavily in nuclear power. But, you can encourage them to change. Against the backdrop of a two-month old Fukushima disaster, May 11 also marks the Annual General Meeting of BNP Paribas and HSBC’s Strategy Day. Ensure the boards of these banks receive plenty of warning about nuclear funding on this day by putting your concerns in writing. "Tell banks not to finance the Jaitapur nuclear power plant in India"
p.s. Once you've sent your message to the board - please consider sending a personal direct message to the banks - we have collected a list of public contacts from BNP Paribas and HSBC here. The more the banks hear from all of us - the better! Thanks again for your support.